I bet even the horrible weather in Gibraltar is nice! Love this card with its soft, pretty colours and that gorgeous ribbon treatment. Another great card Sylvie. Enjoy your stay in the UK. This is really pretty Sylvie! Thanks for another fab card! What a gorgeous image. This is a fabulous card. Beautiful work. Another great card Sylvie! Please visit my blog for a little surprise! A great card!! - that sea looks rough out there. This is so pretty - I love how you always have the sea in the background. 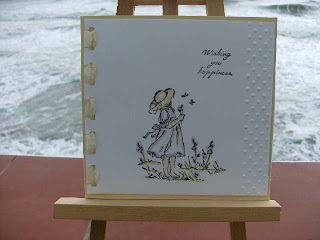 What a beautiful stamp...I LOVE your coloring...such a soft and delicate card! another fab card hope you packed your wellies! Lovely sweet card Sylvie. Bad weather or not I'm still jealous of your balcony! Pack warm clothes, we've had sleet and freezing high winds up here in bonny Aberdeen! This is a really pretty card I love it.